Frida Jones Poetic Baking Extravaganza, 2007. Photo: Jennylin Duany. Elizabeth Doud was born to a tree-hugger momma from the Midwest (that’s me), and grew up in Seattle with the sight and smell and sound of salt water as her daily companions. She channeled her family’s passion for protecting the environment into a devotion to the sea. From Seattle to Miami, where she’s lived for 20 years, to an island in the Bay of Salvador, Brazil, where she currently studies, the ocean has been a constant familiar backdrop. And it has been her great sorrow to witness the ocean’s rapidly accelerating degradation. With her poetry—and her intellect—with her very body she has made climate change her mission. No one who has known Elizabeth (even for a short while) was surprised when years of passionate commitment to environmental issues evolved into the first Climakaze Miami in 2015. Climakaze is an annual event that explores two key questions: (1) How do artists effectively draw attention to climate change, rising sea levels, and the environmental consequences? And (2) How does one engage pods of diverse artists, as well as the broader community, in a free-flowing dialogue about environmental issues? Climakaze Miami is sponsored by FUNDarte, a multidisciplinary non-profit organization dedicated to producing, presenting, and promoting music, theater, dance, film and visual arts that speak to Miami’s diverse cultures with an emphasis on Hispanic arts and culture. Continuous news coverage, expert-authored books, and periodic scientific reports inform everyone who doesn’t have their head in the sand that climate change is a matter of paramount concern. It’s not that we don’t have the knowledge. We lack interconnectedness and resolve to reach out in less didactic ways and join together all those who care. Elizabeth feels like the arts can be this connective tissue in a world overwhelmed with the data and implications of massive biosphere collapse. Elizabeth explains it as: “Digging deep into how arts practice can ignite an awakening around looming complex environmental and social issues and explore platforms for creative action.” She wants to generate movement toward a shared purpose. To me, it is a natural outgrowth of Elizabeth’s trajectory as an artist. An essential part of each Climakaze is a field trip, and it is natural for Elizabeth to include this important component. Close contact with nature was integral to my kids’ – and my own – education. We started camping in the Northwest mountains and on Pacific Ocean beaches when Elizabeth was a toddler. We camped in a tent because as a single mom, I couldn’t afford any other type of vacation, but the tent became an invaluable part of our lives and our understanding of our place in the world. Each year Climakaze participants will get to spend time in a Florida green space. In 2016, it was a marine excursion on Biscayne Bay, and the year before it was a trip to the Everglades. Currently, Elizabeth is working toward a Ph.D. in Performing Arts at the Federal University of Bahia in Salvador, Brazil. With the imprimatur of academia, she plans to grow Climakaze Miami and present it as a model for other cities here and abroad, especially those most immediately threatened by climate change. The first performance in which Elizabeth addressed concerns about climate change was developed in collaboration with Jenny Duany, with whom she formed Las Negras Theater Collective. Sipping Fury from a Teacup addressed colony collapse disorder, the disappearance of bees throughout the world. Sipping Fury from a Teacup, 2010. Photo: Lilliam Dominguez. 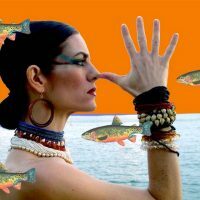 In 2011, Elizabeth developed Si Vas a Sacar Un Cuchillo, USAlo (If you’re going to pull a knife, USE it), her first piece to focus on ocean pollution and the first appearance of her mermaid character, who undulated onstage in a physically demanding performance in response to an oil platform explosion off the Gulf Coast of Florida. Playing opposite Elizabeth in this production was actor-collaborator Carlos Miguel Caballero, who co-created the piece and played an oil worker in a hard hat, covered in black, viscous oil. If you’re gonna pull a knife, USAlo. Courtesy of Elizabeth Doud. Elizabeth’s mermaid, complete with luxurious finned tail, evolved into Siren Jones, star of The Mermaid Tear Factory, a self-described vigilante/mermaid/sea goddess. She is desolate about the destruction of her habitat and longs for humans to understand. She cries copious tears over this calamity (tears, by the way, which are available for sale in vials during her solo site-specific performances on beaches). Not a sweet Little Mermaid, however, she plans to recruit other goddess/mermaids and storm the halls of government to protest destructive human policies. 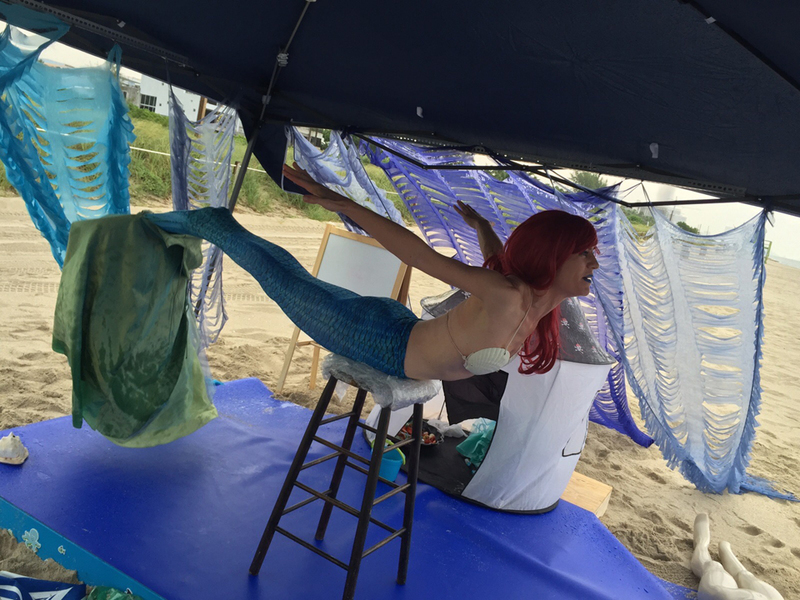 The Mermaid Tear Factory is an ongoing series where Elizabeth aka Siren Jones, surrounded by detritus collected from the immediate shoreline, sets up her tent on beaches and performs for small audiences in 20-30 minute segments. Mermaid Tear Factory, Miami Beach, Fla., 2015. Photo: Tony Martinez. 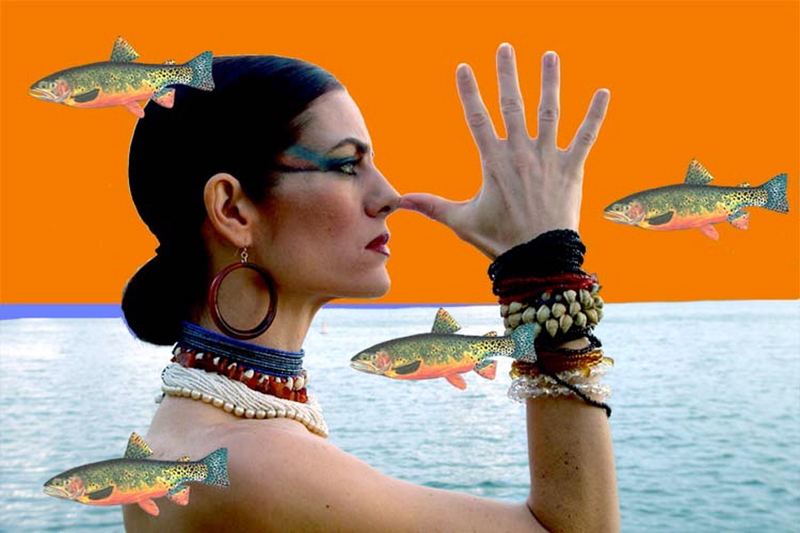 Elizabeth’s performance work, and the design of Climakaze Miami is a natural extension of her performance background and experience as an arts organizer and educator. I tried to impart to my children the belief that we all have something to learn, that we all have something to teach, and that we are never finished learning and teaching. This is the heart of Climakaze. Each one of us holds a piece of the puzzle, and we share that in many different ways. Given a complex and all-too-often erudite topic like environmental collapse, artists can reach others on a level that transcends the data. It is no secret that artists (and teachers) are not assigned the value in our society that many of us believe we deserve. Further, the early doomsayers (for example, Rachael Carson) were dismissed because their views were politically unpalatable and, let’s face it, the science wasn’t always there. That is changing, and the founder of Climakaze believes we all have a role in making our voices heard in a new milieu of increased awareness. Elizabeth wrote that “we need to be able to say that we are doing this for the love of our miraculous planet and not feel dorky-hippy about it. We need to be fully out tree-hugging, whale-saving theater-makers with the wit and word-smithery of Beckett and the political savvy of Boal.” Elizabeth likes to talk about forming a new tribe, made up of those who speak with one voice in a myriad of creative and imaginative ways. I spoke with Elizabeth about her career as an artist and arts organizer, and how culture and ecology have shaped it. JAI: What are your earliest memories of art, and feeling passionate about art? ED: I grew up in Seattle, Washington, a great oasis of progressive thought and environmentalism in the United States. Thanks for that! In the 70s and 80s I watched a lot of dance and theater. I loved the sensation of being in an audience that would collectively convulse with laughter or sympathize with some tragic character and rise to its feet in praise when things were particularly moving. I especially gravitated towards what felt dangerous, shocking and intelligent, and was transported by spectacle in a mystical sense. I first realized I wanted to be an artist during a summer I spent in Spain, in a small town on the Mediterranean coast in Cataluña, when I was 16 years old. It was the hometown of Salvador Dali, and homages to him and his painting were part of the town’s architecture, and it was a center for expatriate painters. I learned about the surrealist painter, and began to comprehend how art reflected and expressed non-conformist thought, paradoxes, and strange beauty—and actually changed things. It helped me explain the world around me, and it held power. JAI: How did college impact your career? ED: I went to Cornish College of the Arts in Seattle to study visual arts, and then I transferred to the University of Washington and got my BA in Spanish and Linguistics. I don’t think I was initially cut out for the solitude of studio work. I gravitated toward language, and live performance, always taking classes in dance outside my major. After I graduated, I wanted to travel, and ended up in Miami through a series of adventures including dance, languages, and love. I eventually enrolled in the Creative Writing Master’s program at the University of Miami, having the good fortune to study with the poet Maureen Seaton, who made being in school fun. I loved the world of ideas that exists within an institution, but I’ve always felt called to a practice (often compulsively), and the reflective part of academics seemed less alive for me. Partly for this reason, it was 10 more years before I started a Ph.D. program in performing arts, which I did for a series of reasons, including access to the world of teaching. I’m in the process of writing my dissertation right now, so there’s a lot being discovered. Universities are political institutions, so you need to understand how they work. School, at its best, teaches you how to learn. For me, understanding and riding the tension between academics that reflect on arts, and the living art itself—especially the performing arts—is very important in a form where the practice is the research. JAI: How would you describe the evolution of your career? ED: Without much of a master plan, I’ve often followed my intuition, and have been very fortunate as an artist to understand the needed skill set for self-employment and freelancing, and to partner with geniuses. Because I love languages, I also got involved in teaching language early on, and was able to enter an academic milieu in a viable job, while still being able to maintain and grow my arts practice. I’d also developed arts producing skills by virtue of having produced my own performance work and eventually became artistic director for the Cultura del Lobo performing arts series at Miami Dade College. I was invited to become the coordinator for a performing arts cultural exchange with Latin America and the Caribbean, which I’ve done for the last 10 years, in association with the amazing arts organization, National Performance Network. International cultural exchange has always been extremely important to me, and my work in this field seems to have come naturally. Supporting the work of other artists feels as important to me as supporting my own artistic work; it’s all part of the same mission. I have an eternal belief that the arts are one of the best uniting and change-making forces that exist. After I left my full-time arts administrator job, I began working closely with my friends and colleagues at FUNDarte, Ever Chavez and Carlos Caballero. I consulted with them to help develop some of their diverse performing arts programming that reflects so much of what Miami is today. At the same time, I was making performance-centered pieces around environmental issues. The idea for Climakaze Miami was germinated during this period. I was feeling very lonely in my arts practice, and increasingly alarmed about climate-change issues, which were calling me to act. I sensed a network of artists working in this field could leverage greater awareness and creative action. FUNDarte generously embraced the idea, and we piloted the first Climakaze in 2015. It was pretty ambitious. We had very limited money, knew a bunch of amazing artists doing great work examining issues related to climate change, and secured a superb venue partnership with the Miami-Dade County Auditorium, so we set the plan in motion. JAI: Who or what has been most influential in your career? ED: I think my most important influential experiences have been team-based art-making with choreographer and performer Giovanni Luquini and actress and performer Jennylin Duany, and the early staff of the Cultura del Lobo Performance series, and later my work with Carlos Caballero. Those experiences cultivated a discipline in risk taking and hard work, and helped me form a truly artist-centered producing philosophy based on exploration, diversity, and equity. Everything that I do today is built on those collaborative, creative, and producing experiences. JAI: Besides Climakaze Miami, what are you working on now? ED: I am working on a performance piece called The Mermaid Tear Factory, which is an ongoing laboratory and environmental performance, and also part of my dissertation research. This project reflects some of my thinking around this kind of theatrical expression as it relates to themes of climate change and environmental devastation. I have presented it in Miami, Havana, and Bahia, Brazil, and performed the work in English, Spanish, and Portuguese. The show itself is a solo performance, and I call it a laboratory because I have been working on it for many years, and it continues to evolve every time it’s performed, which is intentional. It tells the story of a post-post-modern mermaid who has set up camp on the beach because the sea has become uninhabitable due to ocean warming and plastics pollution. So far, I have presented the work indoors and outdoors, but it was originally intended to be performed on beaches. It a moving installation disguised as an agitprop performance. I’m enjoying it because it is a big departure from things I have previously written and performed. It’s a challenge, and also more liberating because it’s interactive with audiences, and also works in public spaces generally, which increases the loss of control of the performance environment. JAI: What are your criteria for taking on a project? JAI: What are the biggest challenges you see for your kind of art? ED: One of the biggest obstacles or challenges for contemporary performing arts is decreasing public funding and private funding (in relation to population growth and other demographic factors) and also audience participation. The rapidly evolving digital age hugely competes in the entertainment industry, making many audiences less available for live performance, especially more experimental forms or things that don’t register as “stimulating.” I recently heard a colleague say that one of the most radical things that we can do as theater-makers today is to ask people to sit for an hour with their cell phones turned off. Completely off. And I believe that’s true. Our connection to our devices is compulsive, and our attention spans are hyper-activated. However, we are humans, and at the end of the day we will always desire to connect with our tribe, to sit in some kind of collective ceremonial witnessing of stories. If this is true, once the digital thrill wears thin, we’ll return to live performance. Our biggest challenge now is keeping the practice alive during the time it takes for the pendulum to swing back. JAI: What has been the impact of environmental performance art? What is the goal? There is also a long history of certain kinds of ceremonial performances that incorporate and reflect on natural processes and interruptions to these processes that are part of the ancestral practices of many indigenous communities on almost every continent on the planet, so I think it’s important to acknowledge this goes much farther back than just our contemporary art memory, and that, whether we know it or not, we are now acting out this same need to dialogue with our surrounding ecologies through performance ceremony, new mythology, and speculative representation. For me, the goal of environmental performance is to create and present live works of art that can be witnessed by a wide spectrum of people, and provoke conversation and reflections around what is happening in our biosphere. There are lots of different approaches depending on the different artists who do this work, but for me, there is a very keen sense that it cannot be didactic, and that it should not preach to its audiences. Many public advisory campaigns want art to “inform” or “teach” people new behaviors, but I think it’s more complex than that: we are now in an age of eco-dramaturgy where a certain kind of Armageddon is the norm. We are scared stiff that our world is rapidly collapsing around us, and it’s almost too much for us to compute as humanoids. Artists can help put a name on that fear and confusion, and help us process the grief, the disbelief and maybe, just maybe, suggest some kind of hope or creative intention that audience members can connect with and take home for future use. Of course, science, government, non-profits, and all the rest play a role, too, but without the poetics, we will be hard pressed as individuals to fully understand the existential challenges that are coming our way. JAI: What does a tree-hugger from the Pacific Northwest find so interesting about Miami? ED: Miami is kind of a gypsy encampment, which is perfect for me. The thing that I find the most interesting about South Florida is the creative fertility and co-existing dysfunction. I mean that in a very loving way. I’ve been living in Miami for 20 years, and I remember first moving here as a young artist and being one of relatively few performance practitioners in the community. Things have changed drastically over the past two decades, thanks to the leadership and diligence of Miami-Dade County Department of Cultural Affairs, and other local funding entities that have continued to place their bets on the creative imagination of the local arts citizenry. But most importantly, thanks to the artists and arts presenting visionaries who have continued to produce performance work and programming despite the difficulty of funding and shrinking audiences, and also the difficulty in retaining artists in our community, as they often leave Florida to find more consistent work and larger opportunities. When things are difficult, you have to work harder to make them function. Miami is particularly good at figuring out how to do things the hard way, or understanding how to make something from constant flux. Maybe it’s a mix of the instinct and wisdom of a diverse population that has come mostly from so many different parts of the Americas—often trying to decrease the difficulty in their own lives. Maybe it’s a function of the latitude being in the subtropics, where two different ecologies have created a bio-region that is unlike anything else in the world. Maybe it’s the ancestral energy of the people who once inhabited much of the peninsula and understood how to survive and thrive in the extreme ebb and flow of the River of Grass. I think there is something about this cultural ecology of crossroads, the manicured beaches, the mangroves, the contraband, the mosquitoes, the relentless backfire of building on a swamp, the eternal sun, the corruption of progress—all of these things make art here interesting, but you can’t approach it like a New York problem. Maybe it’s my penchant for surreal situations, but I think Miami is the city of the future in many ways: its scrappiness, its sea level, its multi-lingualism, its frivolous beauty, its demographics of immigration, its tropical paradise potential, its exquisite fragility and impending doom.